Municipalities and contractors across Canada recognize the Joe Johnson Equipment name and know that it is synonymous with industry-leading products and customer support, but that recognition did not happen overnight. As a matter of fact, for a company that is so omnipresent across the country today, it worked for the first half of its life out of a single location in Barrie, Ontario. Expansion did not come until 2004. Known widely today as JJE, Joe Johnson Equipment is a subsidiary of Federal Signal Corp. (since 2016) and has 11 locations in Canada and 13 locations in the United States affiliated with Federal Signal’s FS Solutions Centers. The company has approximately 300 employees and still calls Barrie its home base of operations. 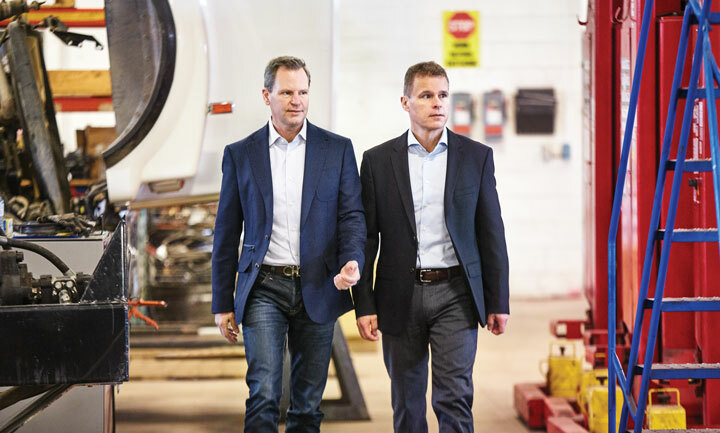 Brothers Jeff Johnson and Joe Johnson Jr. have helped usher in growth at Joe Johnson Equipment,making the company the leading provider of public works equipment to utility owners and contractors across Canada. Formed in 1988 by Joe Johnson Sr. and his son, Jeff Johnson, JJE is Canada’s largest supplier of sewer cleaning and hydro excavation equipment to municipalities and contractors. It also provides equipment ancillary to sewer cleaning and hydro excavation, as well as refuse equipment, street sweepers and snow equipment. Joe Johnson Sr. ran a public works equipment company for 29 years and Jeff cut his teeth in the industry working with his father during three of those years. When the business opened, the bulk of its customers were municipalities but, over the years, that has switched to a more even distribution between municipalities and contractors. That change also coincides with the company’s expansion out of Barrie. “Joe Johnson Equipment started with municipal equipment and then added Vactor to the line up in 1997, covering the sewer cleaning and maintenance sector with its combination units,” says Joe Johnson Jr., JJE president. A young lawyer, he jumped into the business with both feet in 1998 at the request of his father who was diagnosed with, and later died from, cancer. Along with that transition, the company has witnessed significant growth. In 1998, Joe’s first year with the company, JJE did $8 million in sales and this past year, the company closed at $165 million. As the president and a person who was handed the keys to the family company he was involved with for its first decade of growth, Joe says he faced many challenges head-on to position the company for continued growth. That’s something that Joe has aspired to since joining the company as employee No. 7 – and it must work. He happily reports that of the first four people he was involved with hiring — employee Nos. 8, 9, 10 and 11 — one recently retired and the others are still with the company. In addition to focusing on hiring the best people for the JJE team, the brothers have always had an eye on knowing their strategy and that led to the eventual acquisition of the company in 2016 by Federal Signal Corp. for approximately $130 million CAD. The strategic planning session made the JJE team look at the company as it stood and where it wanted to be going forward and the resources it needed to get there. Through a series of strategic planning sessions, it was apparent the leadership wanted to grow not geographically, but with complementary products and grow the fleet, most notably on the rental side. Rental is a capital-intensive prospect and the company approached its banks, which were excited about the project, but the leadership group was about at its max comfort level with debt. “As our Dad would always say, ‘Just because someone wants to lend you money doesn’t necessarily mean you should take it.’” Joe says. This exercise led Joe to look at other avenues to help see this part of the strategic plan to fruition. And the rest, as they say is history. Hydro excavation use has grown by leaps and bounds across Canada as utilities have added safe digging requirements around all buried infrastructure. Joe Johnson Equipment works closely with Vactor Mfg., its sister company, to make sure contractors and municipalities get a properly spec’d machine for their safe digging needs. One of the key philosophies since the company’s inception is to never have to say no to a customer. This is evident by the breadth of equipment JJE offers — for sale, lease and rental — and ties in nicely with its sister companies at Federal Signal. It also helps when navigating provinces, and in some cases regions within those provinces, that have different geographical or regulatory variances. A key example of that is an oil field hydrovac operator in Alberta will require a different rig than a contractor in southeast Ontario. And if either of those entities wanted to work in Manitoba, they would be facing varying department of transportation regulations related to load restrictions. Being part of the Federal Signal family allows JJE’s staff to hone the perfect truck from the planning stages so the customer is best equipped to handle their given project. Having the greatest equipment and the ability to directly bend the ear of an engineer at the manufacturer is great, but without a knowledgeable team that understands the equipment and the customers’ needs, that connection does not amount to much. JJE’s leadership knows this and makes sure the company is actively involved across Canada educating the industry. That education starts at home with a top-down JJE mandate that all employees who are in touch with customers and representing products are given the same level of training as those who operate the equipment day-in and day-out. According to Jeff, this hands-on approach means that JJE is more than just a salesperson for the equipment, but rather they have the hands-on knowledge to understand a customers’ complaints or concerns about a particular piece of equipment. Making sure their employees are involved and have this in-depth knowledge is a big investment, but one that has paid off for JJE. In 2012, the company was first listed as one of Canada’s Best Managed Companies by Deloitte, a rigorous process that required a thorough review of JJE’s enterprise. The company has retained that designation each year since and, in 2015, was named one of Canada’s Best Managed Companies Gold Standard recipients. This award, presented by the Ontario Public Works Association (OPWA) – the Ontario chapter of the American Public Works Association (APWA) – was established to recognize a public works supplier that exemplifies support of the industry and OPWA. And JJE certainly has a track record of supporting the OPWA, serving on the board of directors and various committees, contributing to many of the association’s strategic initiatives and helping out with events, large and small. Joe Johnson Sr. served as OPWA president in 1987, helping spearhead the first APWA Congress held in Toronto in 1988. Joe Jr. served as OPWA president first in 2003 and then again in 2013. For the past three years, Jeff has helped lead the OPWA’s Strategic Plan efforts. JJE was a key supporter of the 2014 APWA Congress held in Toronto, and the company continues be a major sponsor of OPWA and its events. It is partially due to this involvement that JJE received the inaugural award from the board of directors. In subsequent years, the winner will be awarded via a formal nominations process. especially as equipment owners transition away from having their own in-house mechanics. Since its inception, JJE leadership knew that support is a reciprocal endeavor. The leadership wanted to give back to the communities that showed them support through the years. With that in mind, it established the Charity of Choice program. Through the program, JJE queries its employees to submit causes that are important to them. The leadership selects the charity and company-wide the employees rally around that cause. Joe reports that since its inception, the company has not had a repeat Charity of Choice. In 2017, the company’s efforts raised funds for the Seasons Centre for Grieving Children. In 2018, the company is raising funds for Women and Children’s Centres in each of the branch’s locations. Extending beyond the Charity of Choice program, Joe and other members of the JJE leadership volunteer their time to serve on local boards of directors for charities and industry-related associations. And through this, Joe says he and his team have learned much from the engagement that they have brought back and applied to help JJE grow.